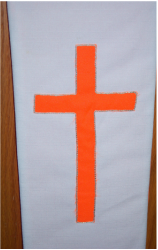 We often have requests for special orders for stoles or paraments. 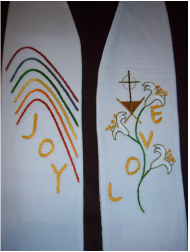 We welcome the chance to work with you to create a unique and original stole or parament set. 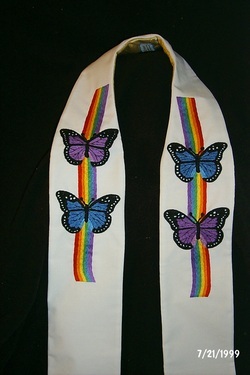 Are you interested in a unique design for your church? Do you have a youth who is a budding artist? Do you have an idea for a design and need a little help? Let us know, and we can help turn that idea into the stole or parament set of your dreams. Here are some special orders that we have made. 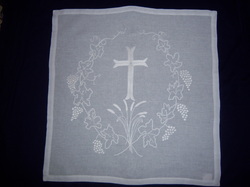 If you are intersted in inquiring about a special order please contact us. We can begin the dreaming and planning process. Designed for a special wedding. This was my first special order. 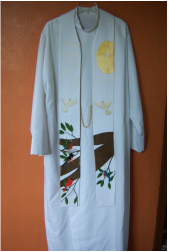 This one was designed by a pastor's wife for her husband. Made for a pastor's hunter's service up in Minnesota.